Yesterday, my husband attended his first meeting as a member of the Railroad Advisory Task Force in Amherst, which is looking at the rail lines in Western Massachusetts and how the area might take advantage of the US stimulus funds for related projects. The task force hopes to promote the idea of a Knowledge Web linked by rail, linking not only the communities in the Knowledge Corridor along the Connecticut River, but also the two land-grant university institutions, UMass Amherst and UConn. Accompanying this would be the rerouting of Amtrak's Vermont service and the potential of increased rail service from the Amherst area to New York City and, ideally, to Boston. Whatever improvements that would be necessary for passenger service would also impact freight in the area and would potentially reduce congestion on the highways, thus creating a combination of new opportunities along with the challenges. In another real-life application of networks, my colleague in the Department of Sociology, Andrew Papachristos, just published a paper on Gang Networks and Murders in the July issue of the American Journal of Sociology. He says, “They kill because they live in sets of social networks in which violence shapes patterns of interaction. The gangs they join carry with them extra-individual sets of social relationships that restrain, filter and otherwise guide the choices and behaviors of gang members.” He concludes that gangs offer mutual protection with an amplified sense of constant threat. In his work he shows how the identification of certain gangs and their control can eliminate violence more than just a sweep through an area. Last year, we listened very intently to Professor Papachristos' presentation, Murder Markets: Group Dominance and the Social Contagion of Gang Homicide in Chicago, in our UMass Amherst INFORMS Seminar Series. Coincidentally, my next conference will be the Mathematical Programming conference in Chicago next month. Finally, while we may study networks and their effects on society, regardless of how we attempt to design our networks to benefit society, we cannot prevent tragedies, due to senseless behavior. This Youtube Video of a potential grade crossing incident, while teenagers play beat the train in Amherst and narrowly escape, strongly illustrates this point. We hope that the Amtrak engineer of the train was not traumatized by the incident. The goal of Operation Lifesaver is to educate the public on the dangers around any railroad track. Coincidentally, Scott Merzbach, the Daily Hampshire Gazette reporter, who was at the Railroad Task Advisory meeting yesterday, also wrote the article in today's Daily Hampshire Gazette on the incident captured in the video. It is still July but I have seen a few colorful leaves falling down in our yard in Amherst. One can sense the anticipation in the air of the new school year beginning. At the Isenberg School of Management we will very soon be welcoming our new Dean, Dr. Mark Fuller, and UMass Amherst will be welcoming its new Provost, Dr. James Staros, a very distinguished scientist, who is joining us from SUNY Stony Brook. With the anticipation comes the excitement about beginnings and renewed energy. Last week, as I mentioned in an earlier post, I was in Cambridge to teach in Harvard's Executive Education program. After an intense lecture on portfolio optimization plus some extensive walking in Cambridge, which included checking out Professor Henry Louis Gates' house, I had an opportunity to watch CNN's special program on Black in America 2, which was hosted by Soledad O'Brien. The segment on Dr. Stephen Perry, the Founder and Principal of the Capital Preparatory Magnet School, in Hartford, Connecticut, was superb, and it continues to resonate with me. If you get a chance to see the rebroadcast, please do so -- what Dr. Perry has done with his school is amazing. All of those who graduate go on to 4 year colleges and the lives that some of the graduates have led and the obstacles that they have faced demonstrate what a great principal, teachers, and educational institution can accomplish. What I found out after returning from Cambridge, is that Dr. Stephen Perry received his doctorate in 2008 from the University of Hartford, where my husband teaches! Please see this release for more information. We are delighted to announce a terrific speaker lineup for the Fall 2009 UMass Amherst Speaker Series in Operations Research / Management Science! This speaker series is organized by the award-winning UMass Amherst Chapter of INFORMS (the Institute for Operations Research and the Management Sciences). I have been the chapter's Faculty Advisor since 2004 and this Fall will be the eleventh semester of continuing operation of our speaker series, which is multidisciplinary in nature and is open to the public. The topics for the fall include: food safety, the financial crisis, Katrina and emergency logistics issues, the optimization of reservoir operations, the nature of wealth and the dynamics of inequality from pre-history to the knowledge-based economy, and cyber-forensics. We are honored to be hosting: Dr. Mary Helander of IBM, Professor Andrew Lo of the Sloan School at MIT, Professor Jose Holquin-Veras of RPI, Professor Richard Palmer of UMass Amherst, Professor Sam Bowles of the Santa Fe Institute in New Mexico and the University of Siena in Italy (and Professor Emeritus of Economics from UMass Amherst), plus Professor Brian Levine of the Computer Science Department at UMass Amherst. The complete titles, abstracts, and information about the speakers and the venue at the Isenberg School of Management can be found here. My course on portfolio optimization in the Executive Education program at Harvard University took place at Gund Hall, which is the location of the Graduate School of Design. I taught in Room 111 and had the pleasure of meeting architects, engineers, real estate executives, investors, developers, and entrepreneurs from around the globe. The students in this very intensive program come from many different countries and it was really enjoyable to interact with them although, I must say, the time available was just too short to cover half a century of topics in portfolio optimization! What really touched me was that, after my course, so many of the students wanted to be photographed with me. It was very gratifying. I also very much appreciated the very intelligent questions that the audience raised. I came prepared with not only the lecture materials, which had been copied for the students, but also with several of my books and with recent articles from Forbes and The Economist. It was a very interesting time to be in Cambridge and to be teaching at Harvard given the incident with Professor Henry Louis Gates, whose home is located just a short walk from Harvard's Graduate School of Design (and, yes, I did see it, along with the various news crew vehicles that were still parked by it and down the street even as late as last Friday and Saturday). Every place that I ate at, the conversations at neighboring tables were about "the professor, the policeman, and the president." Harvard Square is one of my favorite places and part of its charm is that it is such a magnet and one tends to recognize people there and to be recognized. After teaching on Friday, I had the pleasure of seeing Dr. Judith Vichniac there. Dr Vichniac is the head of the Fellows program at The Radcliffe Institute for Advanced Study at Harvard. Of course, we exchanged hugs since she played such a pivotal role in the success of my fellowship year at Radcliffe from 2005-2006. Part of the draw of an extended stay in Cambridge, whether as a Fellow or as an Instructor, is the opportunity to explore Boston and I share with you some photos of Boston above and below taken yesterday. The NY Times article that appeared yesterday had the terrific and terrifying title, "Bridge Fire Reveals the Fragility of New York's Travel Network," and demonstrated the major impact of a fire on July 10 (almost two weeks ago) started by a worker's blowtorch on the Throgs Neck Bridge that resulted not only in an immediate impact but one that has continued to this day. This bridge has been closed to traffic in both directions and this major artery that carries 112,000 vehicles on an average day between Queens and the Bronx severed. Our new book, "Fragile Networks: Identifying Vulnerabilities and Synergies in an Uncertain World," provides measures that identify the importance and rankings of nodes and links in transportation networks that capture the economic impact including the demands and flows (which here would include the 112,000 vehicles per day). Interestingly, throughout this NYTimes article key words from our book title, such as "fragile" and "vulnerability" kept on appearing. UMass Amherst has a nice article on the publication of our book in In The Loop. The official press release was issued by UMass Amherst today. With the deterioration of the infrastructure in the United States, it is time that we do the rebuilding and the building in a coherent, well-planned, transparent, and intelligent manner. The Throg's Neck Bridge incident is just another case of a local incident (the blowtorch fire) having a major impact on the network and its users! Let's identify what we need to protect and to secure, before it is too late. When I travel there are two things that I never leave home without -- my BOSE headphones and the latest issue of The Economist. Many overseas flights have been more enjoyable and productive because of these two reliable "companions." My next trip, which will not require an airplane, however, will be to Cambridge (Massachusetts) to teach a course in Executive Education at Harvard University. The course is on portfolio optimization, clearly a very timely topic given the financial crisis. My lecture and handouts are prepared and I am ready for an exciting experience. I will be bringing, of course, my latest issue of The Economist (July 18-24, 2009), which is motivating, in part, this posting. 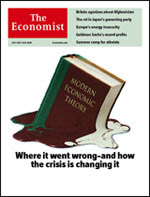 The cover of this issue of The Economist has a brown book with the title, "Modern Economic Theory," that is melting like chocolate in the summer heat. The caption reads: "Where it went wrong -- and how the crisis is changing it." The issue has several articles, which further reinforced the relevance of my my perspective on the material that I will be covering in my course at Harvard. My view of portfolio optimization is that of a critical building block for general financial models that can capture complex interactions among agents in the economy. Classical portfolio optimization problems also have an elegant network structure that can be exploited both for conceptualization and visualization purposes and also for computation of solutions. Such building blocks can help in the construction of macroeconomic models in which one can then explore all sorts of policies such as taxes, tariffs, price supports, transaction costs, etc., and upon which one can also build international financial network models and even explore financial intermediation. I have been writing a lot on financial networks with intermediation and electronic transactions and have supervised doctoral dissertations on the subject. Amazingly, in an article, in this issue of The Economist, on page 66, is written "In many macroeconomic models, therefore, insolvencies cannot occur. Financial intermediaries, like banks, often don't exist." Perhaps some of those macroeconomic modelers should read the literature! A great place to start would be the volume: "Innovations in Financial and Economic Networks" that I edited in 2003 and was published by Edward Elgar. Other relevant papers can be found on the Virtual Center for Supernetworks website. Then, to add further injury, on page 67, and I quote a remark attributed to David Colander, who has been surveying economists: "Instead of solving models 'by hand', using economists' powers of deduction, he proposes simulating economies on the computer." The entire field of Computational Economics is over a decade old and those of use who work in the interfaces of operations research and economics and finance well know the power and the use of not only mathematical models to capture the intricacies of human and economic interactions but also the use of algorithms and computers to predict the results of such interactions, including product and financial flows and prices. We have a Society for Computational Economics, an annual conference (the most recent one just concluded in gorgeous Sydney, Australia), and even a journal! There is a serious disconnect between the literature and the state-of-the-art and what some economists and policy makers are aware of. It is high time that areas of computational social sciences, including computational economics, get the recognition that they deserve! There is some hope, nevertheless -- on page 69 of the same issue of The Economist, Andrew Lo of MIT is quoted and his novel idea of creating a financial equivalent of the National Transport Safety Board to deal with future financial crises! Coincidentally, and you heard it here first, we will be hosting Professor Lo in our Fall 2009 INFORMS Speaker Series at UMass Amherst (co-sponsored with the Finance series). I can hardly wait! This past Saturday, as I had mentioned in a previous posting, my family and I had the pleasure of hosting one of my former MBA students, who was visiting the US from Colombia, South America. They traveled from Bogota to NYC and spent a week there with their relatives before coming to Amherst. What could be more wonderful for a faculty member than to see a former student who has graduated and is now making a mark on the world and who is successful both professionally and personally. This former MBA student of mine wanted to have his family experience where he received his MBA and it was such a delight to be able to reconnect and to reminisce with him. Of course, it was also terrific fun to hear about the professors at the School of Management at UMass Amherst that he remembered and that had made an impact on him (and to hear from him who he considered to be the toughest among my colleagues). It was also fascinating to hear him talk about all the special places in Amherst and Northampton that he wanted to make sure that his family saw. We got to meet not only his wife and daughters but also his sister who is in environmental education and studying at NYU and his brother-in-law who is getting his PhD at the University of Chicago. My former student, Roberto, was my research assistant at UMass Amherst while I was doing a lot of work at the supercomputing center at Cornell University (which was perfect since his father had studied at Cornell) and Roberto was trained as a computer engineer. Roberto went on to work for Colombian Coffee and is now working for a big financial services firm in Colombia and is still involved in raising and riding horses. We got a chance to discuss the economic and political climate in Colombia and to hear, first-hand, what is happening there. Having international students provides an education like no other and, as faculty members, we get to hear what is occurring in various countries even before the news is reported in the media. As a faculty member, one never stops learning and we are very lucky to have the best jobs in the world. I am getting ready to teach my course next week at Harvard University. I have been appointed an Instructor at the Office of Executive Education at Harvard and will be using materials from my latest book, "Fragile Networks: Identifying Vulnerabilities and Synergies in an Uncertain World," as well as from my "Financial Networks: Statics and Dynamics" book. The former book was co-authored with Dr. Qiang "Patrick" Qiang and the latter with Dr. Stavros Siokos, both of whom were my doctoral students at UMass Amherst and are Associates of the Virtual Center for Supernetworks that I direct. The Harvard course that I will be teaching is part of the Advanced Management Development Program and in the course there will be students from numerous countries, including: China, Nigeria, Lebanon, India, Australia, Spain, Morocco, Saudi Arabia, Argentina, and even from the US! This should be an incredible teaching and educational experience. I will be returning to my second "alma mater," since I was a Fellow of the Radcliffe Institute for Advanced Study at Harvard in 2005-2006 and am considered (on top of my four Brown University degrees) to be a Harvard alum. Speaking of returning to own's alma mater, this weekend we will be helping to host one of my former students from Colombia who received his MBA from UMass Amherst and who will be visiting us with his family. The New York Times has an article on habitats that features a writer, Roxana Robinson, and her writing room in mid-Manhattan. The article is very eloquent and evokes Proust and the importance of one's work environment for creativity and getting the job done. Robinson writes in a very spare bedroom of her spacious apartment since she thrives on quiet and the absence of distractions. She has postcards and notes from famous writers for inspiration. She used to write in a large room with a fax machine, access to the Internet, etc., but found herself doing other chores and tasks and not writing. THANK YOU for this book on fragile networks. This is very topical. I just cannot put the book down. Fantastic. Messages such as this one help to prop me up through the weeks and months of intense research that producing papers and books requires. Of course, every once in a while, one also gets an uplifting phone call on one's work as I received yesterday (in the midst of finishing up the paper on supply chains). My uncle called and said that he had received a copy of my book and was near tears because he said it is so well-written and so relevant to his work -- designing bridges and at age 89 he is still a recognized authority even by the Europeans! I love to write and to communicate the research results. Communication is key, whether we do it in writing (essential), or verbally as in giving talks at seminars, conferences, and other venues (such as the World Science Festival in NYC that I took part in last month). Insufficient and inexact communication may be one of the problems behind the lack of understanding, according to a recent study by the Pew Center, of the general population about science (and should I say, research, in general), although scientists and researchers are very well-respected. It is essential that the organizations that researchers work in and the publications that they publish in also help to get the news out in the media, from the newspapers to television. We, as researchers and writers, must focus on what we do best. Yesterday was a brilliant 4th of July in Amherst, Massachusetts and we celebrated the day by going to the town parade in which neighbors and friends who weren't lining the downtown streets marched. Amherst is celebrating its 250th anniversary so there was a float to commemorate this major anniversary as well as groups from the Knights of Columbus and from the League of Women voters to the local Kung Fu club. The parade began with town emergency vehicles from the police cars to the fire trucks and ambulances, complete with blaring sirens, and the parade even featured a group of dancing horses. We watched the parade with my co-author of the Fragile Networks book, Dr. Qiang "Patrick" Qiang, who brought his infant son (who slept through it all in the very fresh air), wife, and mother-in-law, who had recently arrived from China. It was especially sweet and interesting to see her experience her first 4th of July parade in the USA. Last night the sky over Amherst lit up with the fireworks display, which was spectacular! Friday, July 3, 2009, ResearchandMarkets issued a press release on our Fragile Networks book that was circulated through Business Wire and that went viral with the news posted on Forbes.com, Fox.com, cnbc.com, abc.com, and a spectrum of business, supply chain, finance, engineering, math, and other web sites. It was very exciting to see our book, published by Wiley, publicized in this way. We have captured some of the links here. In conducting research one tries to both uncover and to solve underlying mysteries. As any researcher and sleuth knows, this requires patience and great stamina. Plus, it is insufficient to just figure out what is happening -- one also needs to document the findings in publications and to get the news out. 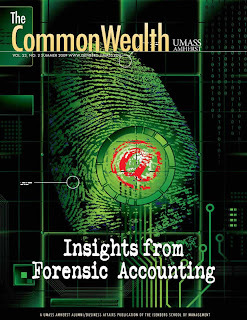 The 2009 Summer edition of the Isenberg School of Management's glossy publication, Commonwealth, which is edited by the school's Communication Director, Mr. Lou Wigdor, captures the spectrum of recent activities at the Isenberg School, including research activities, along with the excitement of discoveries. The cover above is fantastic and draws you into the volume and the article on forensic accounting. Inside the issue, you will find what this great school has been up to in the past few months. My department, the Finance and Operations Management Department, has been busier than ever and I invite you to read inside about the outstanding activities of my colleagues. In addition, you will find a welcome to our incoming Dean, Dr. Mark Fuller, by Dr. Tony Butterfield, who has served as the Interim Dean for the past two years, and has led the school with his professionalism and wisdom. We were delighted to see an article in this issue on our electric power supply chain network research at the Virtual Center for Supernetworks, which resulted in a major paper, co-authored with Zugang Liu, a UMass PhD, who is now an Assistant Professor at Penn State University at Hazleton. The study, which models the electric power supply chain for all of New England, is in press in the journal, Naval Research Logistics, and the preprint can be found here. Chasing research ideas can sometimes feel like chasing tornados and earlier in this blog I wrote about the research team of Professor Frasier at UMass Amherst, since my husband is now on sabbatical at UMass and is working with Professor Frasier as well as with the CASA team, directed by Professor David McLaughlin. Frasier's team was involved in the recent mega project, known as VORTEX2, in which groups of researchers, literally, chased tornados throughout the south and midwest of the United States. The teams spent 6 weeks on the road, sometimes driving hundreds of miles each day, slept in less than ideal conditions, ate what and when they could, all for the goal of gathering data and tracking tornados (which were not appearing at their usual frequencies this past May in the south and midwest). But the project, nevertheless, was a big success and the data is now being analyzed. I salute the students and the researchers who do what it takes to solve those big, challenging problems! The New York Times piece on the value of an advanced degree has commentaries by several leading educators, including one by Dr. Stephen Trachtenberg, which is simply terrific! Dr. Trachtenberg was the President of the University of Hartford, where my husband teaches, and then became the President of George Washington University. Dr. Trachtenberg's intelligence and fantastic sense of humor, plus his wisdom, show through in his commentary. He recognizes that universities are a magical world and that there is nothing like learning something new! Earning an advanced degree takes time, effort, commitment, and sacrifice, but the potential payoffs can be more than worth the investment in both time and financing. Plus, many graduate programs do offer stipends and fellowships. One just needs to do the research and to find the best match. Also, faculty in today's economic climate must help students to develop their professional networks, which can be invaluable when it comes to employment time. Education can take you on paths and journeys that you never realized were out there! Earning an advanced degree may turn out being the best investment made!